A cleaner pushes a 4.50-kg laundry cart in such a way that the net external force on it is 60.0 N. Calculate the magnitude of its acceleration. This is College Physics Answers with Shaun Dychko. The cleaner pushes a laundry cart with a known force that's the net force any way, may not necessarily be the force that the cleaner actually applies on the cart because there could be friction and so on. But we're told that whatever the force that she pushes with, the net force ends up being 60 Newtons. 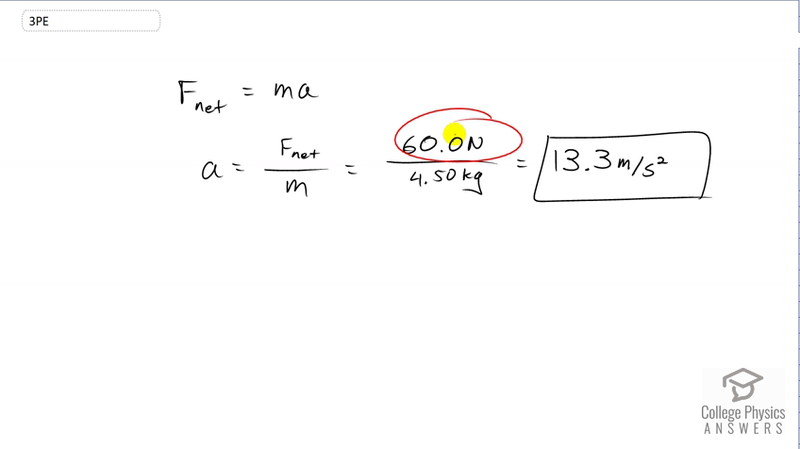 We're going to solve for acceleration in this formula, F net equals mass times acceleration by dividing both sides by m and then switching the sides around. We get acceleration is net force divided by mass and that's 60 Newtons net force divided by 4.5 kilogram mass of the laundry cart giving us an acceleration of the laundry cart of 13.3 meters per second squared.